S*xual compatibility is part of the essentials of a marital union which shouldn’t be handled with levity by the partners. READ: (Pls Advice Me)-I'm Pregnant For My Blood Brother, We're in Love & I want to marry Him. 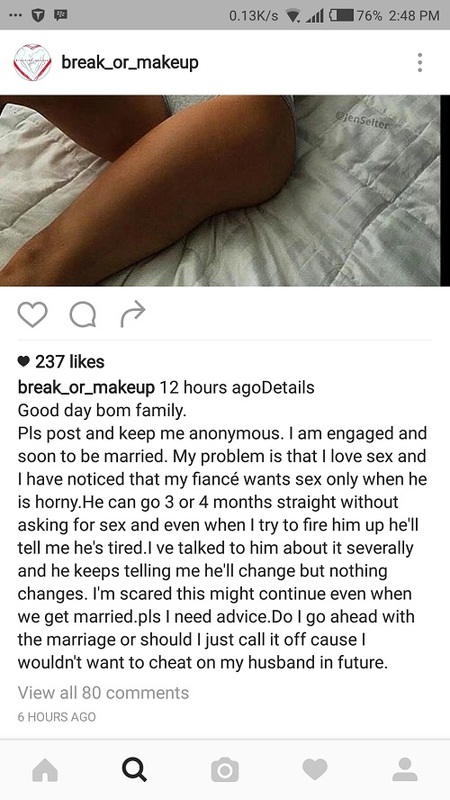 This unnamed lady has written to an online relationship forum on her passion for s*x which is clearly higher than that of her man who can stay for a long time without it. The engaged lady is currently scared of the outcome of such a union as marriage is imminent.